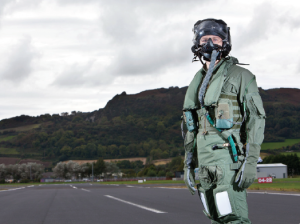 Mark Jackson, Director of Support Services, Key Survival Equipment Ltd.
Safety Case – F-35 Pilot Flight Equipment. Safety Case Assessments are often required as part of a regulatory process, a certificate of safety being granted only when the regulator is satisfied by the argument presented in a safety case. Industries regulated in this way include transportation (such as aviation, the automotive industry and railways) and medical devices. As such there are strong parallels with the formal evaluation of risk used to prepare a Risk Assessment, although the result will be case specific. For example, a vehicle safety case may show it to be acceptably safe to be driven on a road, but conclude that it may be unsuited to driving on rough ground, or with an off-centre load, if there would then be a greater risk of danger e.g. a loss of control or an injury to the occupant. The information used to compile the safety case may then formally guarantee further specifications, such as maximum safe speeds, permitted safe loads, or any other operational parameter. A safety case should be revisited when an existing product is to be re-purposed in a new way if this extends beyond the scope of the original assessment. We have the capability to produce Safety Assessments for a diverse range of products. We can offer support in the production safety and environmental management systems (SEMS) as well as safety and environmental management plans (SEMP). Ensuring our customers receive the correct level of support is the key to delivering first-class products, on time and ready for use. Example: Items of Aircrew Equipment Assemblies (AEA) are often complicated and require in-depth assessments to ensure they remain fully capable throughout their life. As Subject Matter Experts (SME), our staff can assist your company in producing a safe world-class product. We can assist you in order to ensure your product meets demanding test points, or we can run equipment trials to specifications and on your behalf. We carry out Safety Case Assessments covering an extensive range of equipment that is in use worldwide. To find out more, contact us directly by using the form below.